I wanted another ornament in memory of my Dog Taz who passed away in 2010. I've seen quite a few bones and dogs heads but wanted something a little different for our tree. 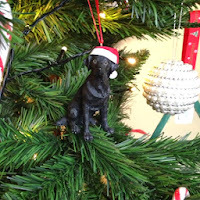 The Hubs bought me this black lab ornament Christmas 2009 little did we know at the time that it would be our last christmas with us. This is a really simple ornament to make, either sewing like I did or you could just glue as we did for our robin ornament. Obviously the colours would be personal to you and you can personalise it by sewing on your chosen name as I've done here or leave it blank, there's lots more space on the back for a longer name and/or dates. I added a tiny bit of stuffing to mine to give it a little dimension as the colours are quite muted. If you are sewing, you might need to trim a little off each of the pads, they are fine for gluing but will be a tiny bit big if you sew. At this point I'd like to apologise for the quality of my sewing on this project, I absolutely love felt projects but I'm not great at sewing! I'm trying not to let that deter me!. 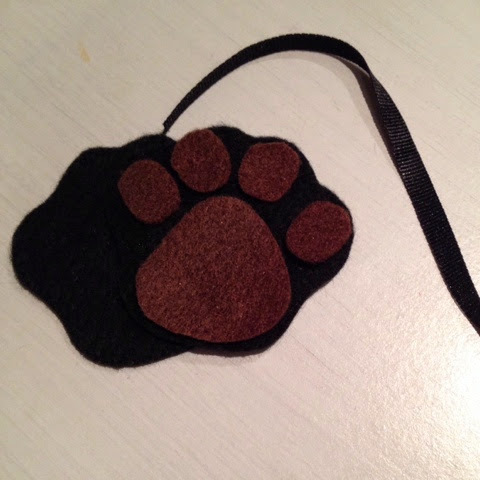 Should you like to make one of these yourself the Dog paw ornament template can be downloaded here. Hello, nice to finally make it to your blog after our brief twitter exchange about guest posting. 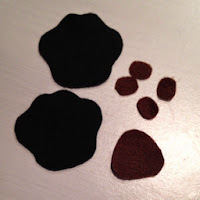 Your dog paw ornament intructions are easy to follow, even for folks like me who are not very good at crafts.